Digital cameras are becoming more and more popular and are beginning to replace traditional film cameras. Even Kodak, a camera industry leader, stopped selling traditional film cameras in 2004. If you’re in the market for a digital camera, read on for more information on how digital cameras work and how to choose the one that best suits your needs. Digital cameras are equipped with a charge-coupled device (CCD) that uses millions of light-sensitive elements, known as pixels, to create a digital image. When you press the shutter release button on the camera, light hits the CCD and an electrical charge is triggered. The strength of the charge dictates the color of the pixel. If no charge is produced, the pixel is black. If a full charge is produced, the pixel will be white. The colored pixels are converted to digital format and each pixel represents a single dot in the image. The more pixels there are in an image, the sharper the picture will be. The clarity and sharpness of a picture is known as its resolution. Resolution is read based on the number of pixels, in a horizontal to vertical ratio. If you multiply the horizontal times vertical pixel numbers, you will be able to determine how many pixels are in a square inch. The basic resolution for most digital cameras is 640 x 480. You can learn more about resolution, how resolution is expressed in terms of megapixels and which resolutions will yield the best printed results on this chart. Many digital cameras come with all the necessary accessories directly from the manufacturer. When you buy a digital camera, make sure that you get the appropriate batteries and battery charger, a memory card to store the photos inside your camera and a cable or card reader device to transfer images from your camera’s memory card to your computer. You may also wish to consider purchasing a carrying case to protect your camera and accessories. You should also be sure to read the Owner’s Manual or User Guide for your camera before using the camera or connecting it to your computer. For further information on the features, accessories and options to consider when purchasing a digital camera, please review this article from Cnet. You can also find reviews on several manufacturers and models at PC Magazine and Cnet. I’ve got a digital camera. Now what? One of the greatest advantages of a digital camera is the instant gratification that you receive when taking a picture. With a traditional camera, you have to wait at least an hour to get your photos developed. Then, to top it off, when you get the pictures back you realize that the lighting was poor and everyone in the photo has red eyes! 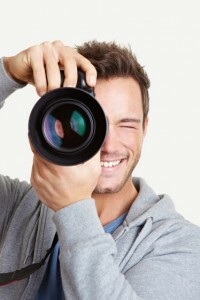 Digital cameras allow you to immediately review your photos and retake them, if necessary. Then, you can save the images on your computer and touch them up with photo editing software to add borders or text, correct red-eye and adjust brightness and contrast. You can email your digital photos to friends and family, save them to a CD or send them to a photo lab for printing. Many photo sharing web sites are also available to store and print your digital pictures. Some services will also imprint your digital pictures on t-shirts, coffee mugs, calendars, notepads and other items. OfficeDepot: You’ll find name brand digital cameras including Canon, Sony, Nikon, and Polaroid at Office Depot, along with digital frames, batteries and storage devices. Office Depot prices are hot! Shop online now to save big on monitors, cameras, laptops, printers and more! Sony: This site offers a wide variety of equipment and information on Sony computers, notebooks, cameras, MP3 players, televisions and home theater systems, GPS devices, video games and consoles, as well as personal communicator devices. Newegg.com: This site offers more than 25,000 computer hardware and software, consumer electronics and communications products in stock at competitive prices and ready to ship at lightning-speed. Dell: Digital cameras and accessories for home and business users.